JEHOVAH RAPHA, we come before Your THRONE OF GRACE requesting Your Holy Presence. We bow down and pour out our hearts to You, oh Lord. We have been captured by Your Holy calling. Cleanse our mind, body and soul, make us pure and whole as we are washed by the BLOOD of the Lamb. Take us, mold us, fill us, lead us and walk beside us as we give our lives to You, the MASTER POTTER! 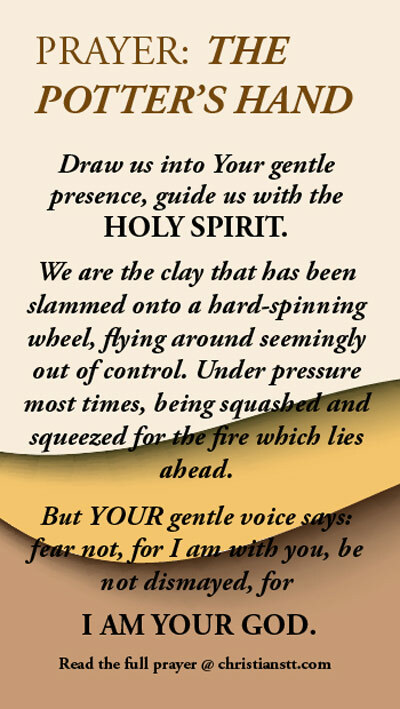 Draw us into Your gentle presence, guide us with the HOLY SPIRIT. Teach us, Dear Lord, to live all of our lives through Your eyes. We are the clay that has been slammed onto a hard-spinning wheel, flying around seemingly out of control. Under pressure most times, being squashed and squeezed for the fire which lies ahead. But YOUR gentle voice says: fear not, for I am with you, be not dismayed, for I AM YOUR GOD. I will strengthen you, I will help you, I will uphold you with the right hand of MY righteousness. Lord, teach us that you have carefully thrown us into the right spot for our imperfections to be smoothed out as we spin and as, by the tender, loving pressures of Your hands, You are holding and molding us to become your beautiful creation and the fire that lies ahead will only enhance our beauty. We will make You a proud loving Father, we will obey Your will and plans for us as You reveal them day by day and we declare that one day as YOU mold us, we would be exactly who YOU want us to be…a REFLECTION OF CHRIST. In JESUS’ mighty name we pray, Amen! Jeremiah 18:2-6 “Arise and go down to the potter’s house, and there I will cause you to hear My words. Then I went down to the potter’s house, and there he was, making something at the wheel. And the vessel that he made of clay was marred in the hand of the potter; so he made it again into another vessel, as it seemed good to the potter to make. 5 Then the word of the LORD came to me, saying: 6 “O house of Israel, can I not do with you as this potter?” says the LORD. “Look, as the clay is in the potter’s hand, so are you in My hand, O house of Israel!